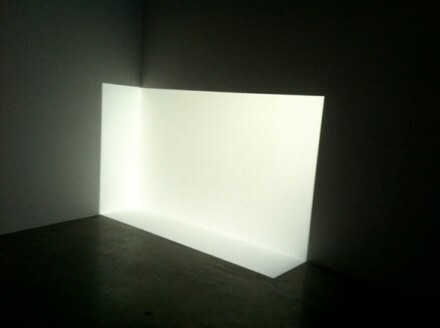 James Turrell, Carn White (1967). Photo on site for Art Observed by Megan Hoetger. 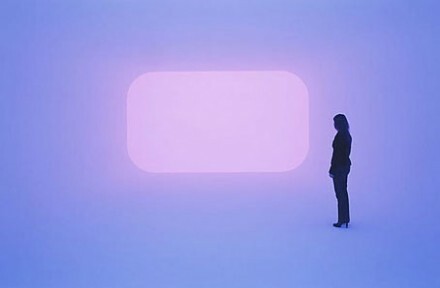 The James Turrell exhibition, Present Tense, is currently showing at Kayne Griffin Corcoran in Santa Monica. Presented in conjunction with the Pacific Standard Time (PST) programming, the exhibition includes some of Turrell’s most recognizable works, ranging from the 1960s to today. Although the official opening weekend of PST is the first weekend in October, many participating galleries across Los Angeles have already begun to open their doors to exhibitions, many which explore the development of an art capital in Los Angeles from 1945 to 1980. In addition to the solo exhibition at Kayne Griffin Corcoran, Turrell’s work will also be included in historical group shows, including Phenomenal: California Light, Space, Surface at the Museum of Contemporary Art, San Diego, and Best Kept Secret: UCI and the Development of Contemporary Art in Southern California, 1964-1971 at the Laguna Art Museum in Laguna Beach. As the list of exhibitions makes clear, Turrell’s work is some of the most important to come out of the Los Angeles scene since its early years in the 1960s. And indeed the sparse but powerful installations on view at the gallery deliver all that we would expect of such an influential body of work. On view at Kayne Griffin Corcoran are four installations, which map the artist’s practice from the early projections, circa 1967 and ’68, to more recent pieces from 1991 and 2011. Carn White (1967) and Phantom Blue (1968) represent the artist’s early career. Both are simple, solid color field projections, which seem to protrude from the surfaces as a sculptural form. This is particularly evident in Carn White in which the white square of light is projected into the already ambiguous corner where walls meet floor. 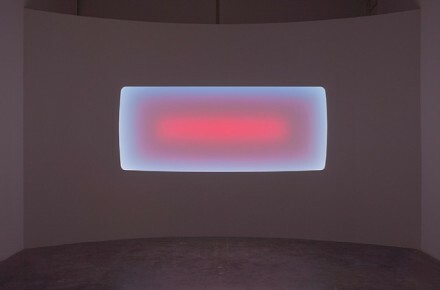 In Present Tense , a Space Division Construction from 1991, the viewer enters a darkened room with what appears to be a projection of a red rectangular field, which is slightly curved along its surface. What one realizes upon closer inspection, though, is that this is in fact a real space that has been flattened out. This transformation of the three-dimensional space into a two-dimensional one is disconcerting to say the least. Where the earlier works used simple projections to transform a flat surface into a dimensional form, here it is the opposite perceptual effect. 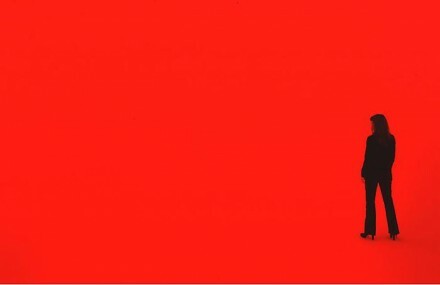 Even as I put my arm out into the glowing red space and it begins to appear slightly blurred, separated from my body, and flat, my eye could not reconcile what my mind knows with what it was visually interpreting. After a while, the whole room began to glow red and pulse with the luminosity of the hue. Now my eye had become sensitive to the subtle and yet persistent fluxes in the (color) light, which quite literally define the contours of the world we inhabit. In the most recent work, Yukaloo (2011), the more simple projections and lighting techniques are traded in for programmed LED lights that change slightly over a ten-minute period, creating vivid shifts in color despite being only small increments of change. Similar to the earlier works, though, Yukaloo confounds our perceptual ability to differentiate between flatness and dimensionality. Here the glowing, pearlescent capsule-like form appears a finish-fetish sculpture mounted to the wall. We find out once again, though, that the “rules” of spatial logic have been bent. Having done much experimentation and research into the phenomenon of perception and the field of perceptual studies over his career, beginning with his notable participation in the landmark Art and Technology exhibition at the Los Angeles County Museum of Art in 1967, Turrell is a master at foregrounding the gaps between our intellectually capacity for “making sense” of the world around us and our phenomenological experience of it. While much can be said about Turrell’s context and his rigorous philosophical and scientific investigations of the phenomenology of perception, his work has perhaps seemed always to be about the wild experience of being immersed in it with one’s own body. There are some things that simply do not translate well in this age of the digital. This entry was posted on Wednesday, September 28th, 2011 at 9:19 am	and is filed under AO On Site, Art News, Go See. You can follow any responses to this entry through the RSS 2.0 feed. You can leave a response, or trackback from your own site.